Ostensibly “The Vanities” (Prydwen Press, $24.95) is a children’s book, but to heck with that. Terence Lawlor’s fashion collages, witty, sophisticated and sublime, are good for the grownups, too. 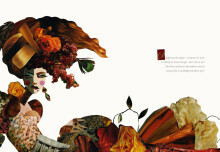 The collages, cut with awesome precision from photos, are deeply textured and rich with decorative appeal. The fabrics are seeded with pearls or glow with lustrous colors. Meanwhile, hair’s the thing in “The Vanities,” and it’s woven in ribbons or embedded with things likes berries, jewels and pine cones. Three divas, Carlotta, Wilhelmina and Delight, make a habit of taking home the prize. There the nasty girls have secreted away Giselle, left on their doorstep as a baby, who’s a wizard with a brush and blow-dryer. The divas fight over Giselle’s ministrations while her own long, black hair goes unattended. On the night of the ball though … Well, we can’t give away the ending, except that it’s happy. But we have to say, Giselle can really work a crown.